Anthurium kallunkiae Croat, sp. nov. TYPE: Panama. Veraguas: NW of Santa Fe, 2 km beyond Escuela Agricola Alto Piedra, ridge top cloud forest below summit of Cerro Tutc, above 1,200 m, Mori & Kallunki 5254 (MO 2300023, holotype). Planta epiphytica; cataphyllum persistens in fibris tenuibus; petiolus sulcatus, 2.5-5 cm longus; lamina sicce subcoriacea, oblongo-elliptica, basi acuta ad attenuata, 12-18 cm longa, 4.5-6.3 cm lata, utrinque glanduloso-punctata; inflorescentia erecta; pedunculus teres, 3.5-4.5 cm longus, spatha viridis ad pallide lutea membranacea, lanceolata, 3-3.5 cm longa, spadix viridis ad pallide luteus, 5.5-6 cm longus; baccae ignotae. Epiphyte; stems densely rooted, less than 15 cm long, ca. 1 cm diam. 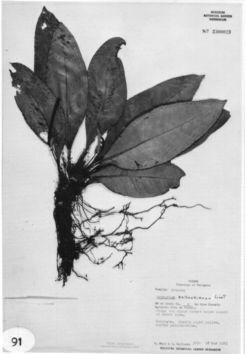 ; internodes short; leaf scars obscure, hidden by cataphylls and roots; cataphylls 3-4 cm long, promptly weathering to slender, light reddish brown, persistent fibers. LEAVES erect; petioles sulcate, often drying sharply 3-sided, 2.5-5 cm long, 2-3 mm wide; geniculum 6-10 mm long, drying blacker than the rest of the petiole; blades drying thickly chartaceous, oblong-elliptic, weakly acuminate at apex (the acumen thickly apiculate), acute to attenuate at base, 12-18 cm long, 4.5-6.3 cm wide, broadest usually at about the middle, both surfaces semiglossy, the upper surface densely whitish speckled, sparsely glandular-punctate, the lower surface paler, more conspicuously and densely glandular-punctate; midrib raised on both surfaces, often drying acute beneath; primary lateral veins 8-10 per side, departing midrib at 30-40° angle, moderately straight to the collective vein, relatively obscure above, prominulous below; interprimary veins usually much less distinct than the primary lateral veins; collective vein arising from the base, 2-5 mm from the margin. INFLORESCENCE erect; peduncles terete, 3.5-4.5 cm long, spathe green to yellow-while, thin, lanceolate, broadest at about the lower one-third, abruptly acuminate at apex, acute at base, the margins meeting irregularly, one often markedly lower than the other, inserted at 45° angle on peduncle; spadix green to light yellow, tapered toward apex, 5-6 mm diam. at base, 2.5-3 mm diam. near the apex; flowers rhombic, 2.5-3 mm long; 4÷5 flowers visible in the principal spiral, 6-8 in alternate spiral; lateral tepals 0.9-1.7 mm wide, the inner margin more or less straight, the alternate tepals with the inner margin straight to concave; pistils not emergent; stigmas linear, ca. 0.5 mm long; stamens emerging just above the edge of the tepals, retracting completely after an-thesis; anthers 0.3 mm long, 0.7 mm wide, the thecae ellipsoid, divaricate, opening broadly. INFRUCTESCENCE not known. Fig. 91. Anthurium kallunkiae is endemic to Panama, known only from Veraguas Province in the vicinity of the type collection on Cerro Tute at over 1,000 m in what is probably lower montane wet forest. The species, a member of section Porphyrochitonium, is distinguished by its epiphytic habit, its short stem with persistent, weathered cataphylls, its short-petiolate, lanceolate-elliptic, glandular-punctate leaves, and by its short pedunculate inflorescences (much shorter than the leaves) with light yellow spadices and yellowish white spathes. The species is superficially similar to Anthurium tacarcunense, which has leaves of similar size that also dry somewhat grayish green, but in contrast to A. kallunkiae this species has longer petiolate leaves that are broadest above the middle and relatively longer petioles and peduncles. The species is named in honor of Jackie Kallunki, one of the collectors of the type specimen. Veraguas: NW of Santa Fe on Cerro Tute, Mori & Kallunki 5254 (MO), Mori et al. 7571 (MO), Kress & Knapp 82-1413A (DUKE).